47146 Sun Feb 24 13:35:26 EST 2019 Calen Chang Essex Jct, VT , US Bayer, stop pumping toxins into our environment. Think about our future. Save the bees. 47145 Fri Dec 28 16:47:15 EST 2018 Susanne Kiriaty Paia, HI , US Please stop killing the bees, we need them! 47142 Tue Oct 30 12:41:33 EDT 2018 Penelope Mason Decatur,, GA , US Bees are so extremely important to our food supply. 47141 Tue Oct 23 09:55:39 EDT 2018 Maria Farina Philadelphia, PA , US STOP killing bees and other life. NO more neonics. 47139 Mon Aug 06 17:42:23 EDT 2018 Anonymous Santee , CA , US Please save these wonderful creations these are a gift from God!! 47136 Wed Jul 05 20:07:27 EDT 2017 Bonnie Conroy Windsor, VA , US This is an atrocity!!! 47132 Wed Mar 08 20:25:32 EST 2017 Anonymous poughkeepsie, NY , US All I can say is help the bees. 47125 Fri Oct 21 21:47:30 EDT 2016 Robert Bautista Sacramento, CA , US In an effort to feed the world's population, common sense must out weigh greed for greater profits. 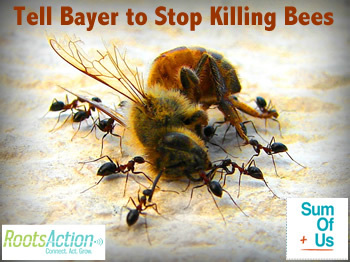 Stop killing bees and other pollinators in the pursuit of agricultural growth.